Up for grabs? North Pole web cam image from US NOAA. Russia plans to grow. It may do this by annexing 1.2 million square kilometres of Arctic Ocean. That’s a piece of Earth more than twice the current size of the Ukraine. This includes the North Pole. And potentially a lot of oil, gas, and minerals that other countries are claiming. Distressful news, to say the least. But it is not yet a done deal. Here’s how the takeover could work. By international agreement, every country in the world is allowed to claim and completely dominate abutting ocean out to a distance of 200 nautical miles (370 kilometres). If this runs into a neighbour on the opposite side of a sea, the border meets in the middle. To exercise any control beyond that (in other words, to extend its maritime boundary into open, unclaimed seas), a country has to show that its continental shelf extends further than 370 kilometres. If it does, the country may claim the sea floor and any treasures below – but not the water column above. Sounds complicated, but if a country can show that its shelf goes on and on, it can claim subsurface minerals, oil, and gas indefinitely – but it can not stop marine traffic or fishing in the international waters above. The United Nations granted the five countries encircling the Arctic Ocean a deadline to stake claims to the arctic. Last year, Canada produced geophysical and geological data that suggests Canada’s claim goes well beyond Canada’s Arctic Islands and extends up to the North Pole. It seems to be a valid claim, supported by oceanography data. However, this week, the Russian research vessel Akademik Fyodorov ended its surveys and the Russians immediately announced that their continental shelf also reaches the North Pole. Apparently not needing to wait to analyze the new data, the Russian Minister of Natural Resources and Ecology (Sergey Donskoy) announced, “We lay our claim on 1.2 million square kilometers of the Arctic Ocean. That is a big increase to our country’s territory, that’s why we call this application an application for the future – an application for the future sustainable development of our country.” This is according to the Russian news source Novosti. The Russian Ministry of Natural Resources will file its submission with the UN in the spring of 2015. By then, the Russian scientists should have had time to interpret the new raw data. But don’t expect the scientific results to differ from the political announcement already made. Novosti says that Minister Donskoy called the North Pole research unique work. “Our main goal there was to conduct seismic exploration and we managed to achieve it. The seismic exploration of this kind was conducted for the first time in the world.” Not really. Marine seismic exploration and bathymetry surveys are hardly new nor unique – they have been around since the late 1930s and are no different than seismic data acquisition performed by the other four countries completing for a slice of high arctic resources – Canada, Denmark/Greenland, Norway, and the USA. 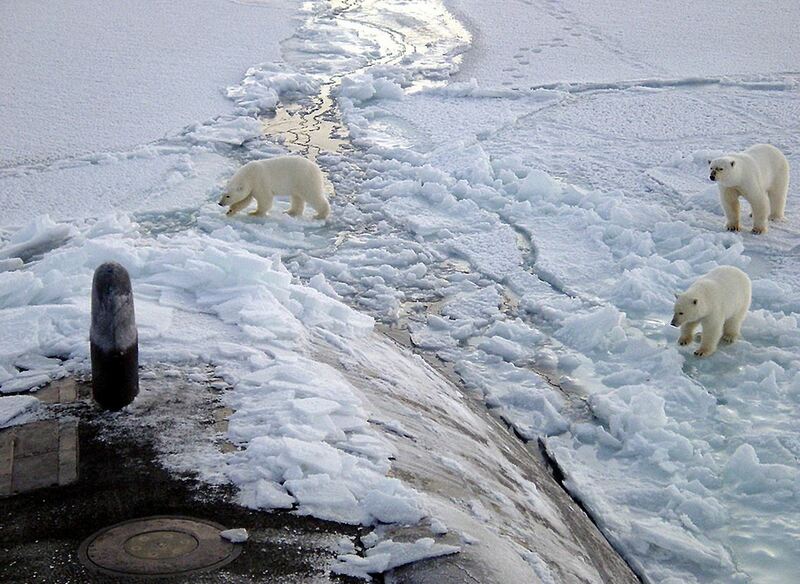 Ominously, the Russian military also takes a great (non-scientific) interest in the Arctic and that may ultimately decide the North Pole’s ownership. Russia will complete deployment of military units along the Arctic circle by the end of 2014, Defense Minister Sergei Shoigu said on Tuesday. This entails the establishment of 10 naval bases from Murmansk to Chukotka. “We have been very active in the Arctic region lately, and this year we will have a large number of units deployed along the Arctic circle,” Shoigu said. 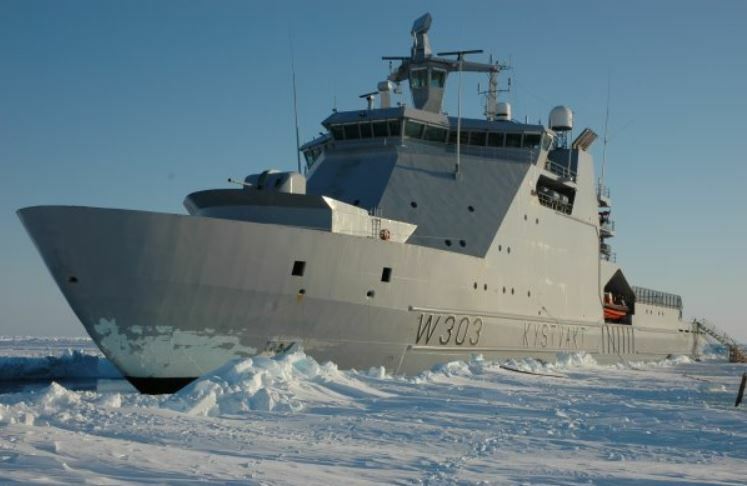 The KV Svalbard, a Norwegian Coast Guard vessel, is the model for future $700 million Royal Canadian Navy patrol vessels. Announced in 2007, none have been built yet. But Canadian Prime Minister Harper revealed in September 2014 that the first ship will be called Harry DeWolf – if it is ever constructed. Canada, the second big player in the arctic waters, has done little to protect its interests. Seven years ago, Prime Minister Stephen Harper announced that an arctic training centre and deep water naval base would be built. One training base. That singular Resolute Bay base, announced with much bluster in 2007, finally opened last year. The proposed deep water port will be a resurrection of an old mining port at Nanisivik. A Nunavut military base was also announced in 2007, but construction hasn’t even started. “Canada’s very good at plans, but not so much at execution,” says Dr Rob Huebert, a University of Calgary professor, and arctic defence policy expert. Canada’s policy in the far north has been hesitant, to say the least. Currently, Canada has 150 soldiers protecting its four million square kilometres of arctic territory. Russia has thousands of troops along its expanse of arctic waters, stretching half-way around the entire planet – from Norway to Alaska. The four non-Russian countries with an interest in the far north are all NATO members, so their combined presence could counterbalance the Russian occupation. There were even plans for joint Russian-NATO arctic exercises. But on October 20, Russian Foreign Minister Sergei Lavrov casually stated that NATO’s presence in the Arctic “was unnecessary.” There were no problems in the region, the foreign minister continued, that required NATO’s participation. Everything was working well in Russia’s capable hands. Back in April, President Vladimir Putin described a network of military facilities, warships and 13 aircraft bases as part of his plan to protect Russian interests and its territorial claims in the region. Relations are wary and Canada has been cautious – especially after Canada (which has the world’s largest diaspora population of Ukrainians) openly supported Ukraine’s Crimean claims. Russia retaliated by sending fighter planes over Canada’s arctic waters this summer. You may wonder how the United States figures into all of this. Dr. Huebert, of Calgary’s School of Policy, calls the USA “The Reluctant Arctic Power” and has written a policy paper with that title. He begins his study stating “the Arctic has seldom figured prominently in US policy.” The USA, of course, has a permanent Arctic presence through the state of Alaska and has long produced oil from the North Slope and Prudhoe Bay. But Huebert is right, the USA seems ambivalent to the opening arctic waters. While the United Nations asked the arctic countries to submit their territorial claims (Russia, Canada, Denmark, and Norway responded) the Americans ignored the filing deadlines. This could be because the American arctic frontier is only 1,000 kilometres long and holds little prospect of shelf-extension. In contrast, Canada has over 5,000 kilometres of arctic frontier and Russia has 7,000. With respect to Canada, the Americans have sometimes been abrasive. There is a serious territorial dispute between Alaska and the Yukon regarding near-offshore waters. 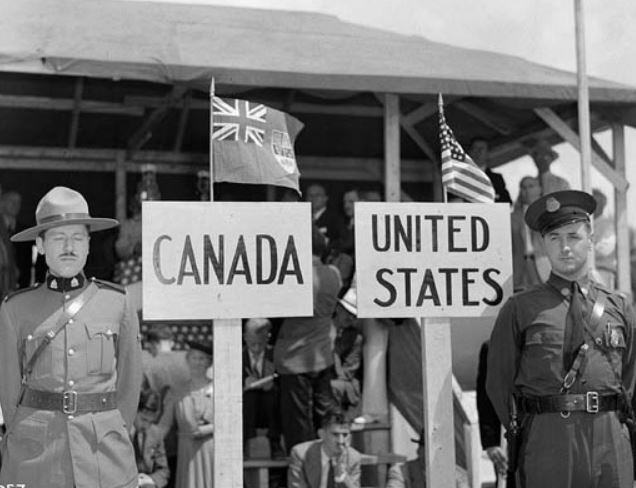 Canada claims the border continues northwest, perpendicular to the coastline while the USA disagrees and extends the border into Canada’s claimed zone. At stake is a Beaufort Sea resource play with millions of barrels of untapped oil. Further north, the Americans recently sent a nuclear submarine through passages between Canada’s archipelago of islands. Canada demanded advanced notice and a request for permission. None was sought. To save face, Prime Minister Harper quickly dispatched an ice cutter to “accompany” the Americans. Nevertheless, Harper’s best defense of the Canadian arctic frontier is not his 150 troops but a reliance on American help to push Russia back – if pushing is ever needed. Canada and the USA are, after all, friendly allies. Last December, Canada was about to submit its own Arctic claim when Prime Minister Stephen Harper asked his science researchers to expand their results and include the North Pole. The original Canadian claim didn’t include the North Pole, which lies near a large oil patch. But with prime-ministerial urging, the pole was added. It sounds like a political add-on of the sort the Russians themselves pulled. The Canadian assertion, however, is not bogus and from the maps I have seen, has more scientific merit than the Russian counter-claim. What is there to protect? Or take? Plenty. According to the United States Geological Survey, the arctic holds one-third of all the untapped oil and gas in the world. We don’t even know what other exotic delights (diamonds, gold, platinum, manganese, nickel?) await future explorers. The US Navy has concluded that global warming is real and that the Arctic will be ice-free each summer, likely starting in 2016. If true, this makes mineral and oil exploitation more tenable. And delivery of pumped crude by tanker ships will also be possible. Which brings us to the other strategic advantage belonging to the country owning the arctic waters. The fabled Northwest Passage – sought since the days of Henry Hudson in 1610 – is the shipping route between Europe and Asia across the top of the globe. Until the Panama Canal was built in 1914, European freight traveled around the southern tip of either South America or Africa to reach Asia. A much more direct route links Europe and Japan, Korea, and China through the arctic. With global warming, the sea route is becoming feasible. In ten years, it will be the regular normal passage for most freight, according to the Council on Foreign Affairs. The Russians tested a northern passage last year when an enormous empty liquified natural gas freighter – a tanker operated by Russian gas giant Gazprom – traveled from Japan to Europe (Hammerfest, Norway) where it was loaded with LNG. 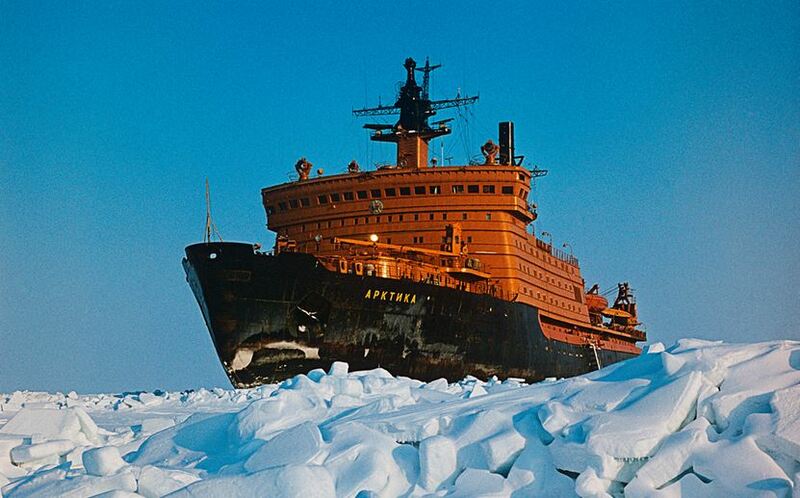 Accompanied by Russian nuclear-powered ice breakers, it then brought the liquified gas fuel back to Japan. The press largely missed this event, but it has phenomenal importance. It was the first commercial delivery of commercial cargo across that 6,000 kilometre stretch of the Arctic. The entire tanker journey (from Norway to Japan via Russia’s Northern Passage) was 11,000 kilometres. The alternative shipping route (from Norway to Japan via the Suez Canal) is 22,000 kilometres – if the tanker could squeeze through the canal – otherwise it would need to sail around Africa’s cape, a journey of 31,000 kilometres to Japan. The Russian route cuts a three-month trip to one month and saves hundreds of thousands of dollars in freight costs. What is the science behind these territorial claims? International law bestows mineral riches to the countries that can show their nation’s continental shelf extends beyond the 370 kilometres of ocean normally given to a seafaring country. Continental shelf is determined in two main ways – the rock type on the sea floor and the depth of the water. In most passive margins, water meets land which slowly disappears as one ventures further asea. It is not unusual for shelves to extend several hundred kilometres with water as shallow as a few hundred metres. But almost everywhere, the land then suddenly plunges to the average sea floor depth of over 4,000 metres. It is well-nigh impossible for any country to claim that sort of a depth is a natural extension of a continental shelf. The average depth of the Arctic – the world’s shallowest ocean – is only 1,050 metres. It is almost easy to confuse real continental shelf with real ocean sea floor on the basis of depth or topography. That’s why another determinant is useful. This is rock type. Continents (and shelves) are lighter weight rocks like granite and they rise above the asthenosphere. Ocean crust is heavier, basaltic rock. For a solid shelf-claim, rock samples are retrieved and they best not be basalt. Russia has been using the extension of the Lomonsov ridge to booster its claims to the North Pole and much of the Arctic. The Russians say the ridge is an extension of the Eurasian continent. But the Lomonsov ridge is peculiar. It might not be shelf at all. Lomonsov is an 1,800 kilometre long ridge of narrow, uplifted continental crust. The rock type is continental. The ridge rises 3 kilometres above surrounding arctic water but is nevertheless rather deep, almost entirely lying under a kilometre of water. The Russians view it as an ancient craton – a chunk of exceedingly ancient continental crust that has survived the rifting, drifting, and merging of continental plates and has stayed attached to its tectonic host. But which host? Eurasian or North American? Therein lies the great debate. The Lomonsov Ridge is near the centre, crosses the North Pole, and extends to Greenland. From this single view, it is seen terminating at the boundary between Greenland and Canada but is detached from Russia. Image from NOAA Commons. The Russian scientists claim seismic data shows the craton is an extension of their continental shelf. But so do the Danes with seismic acquired by the Greenland and Denmark Geological Survey. I have worked with seismic data from the arctic, but not these two data sets. However, I can imagine it would be easy and convincing to extend the underlying shelf from either side. Seismic geophysics is a creative art. Cross-sections built from the Danish data (which I have seen) are persuasive and show the Lomonsov ridge rising to a relatively shallow height just north of Greenland. The ridge’s attachment to either shelf and its tectonic history are vitally important to the UN decision. Lomonsov might be a non-shelf crustal feature rather than an extension of a continental shelf – but, again, whose shelf? The ridge crosses confirmed Canadian territory, north of the Canadian Arctic Archipelago. Meanwhile, the Danes believe it is an extension of Greenland. 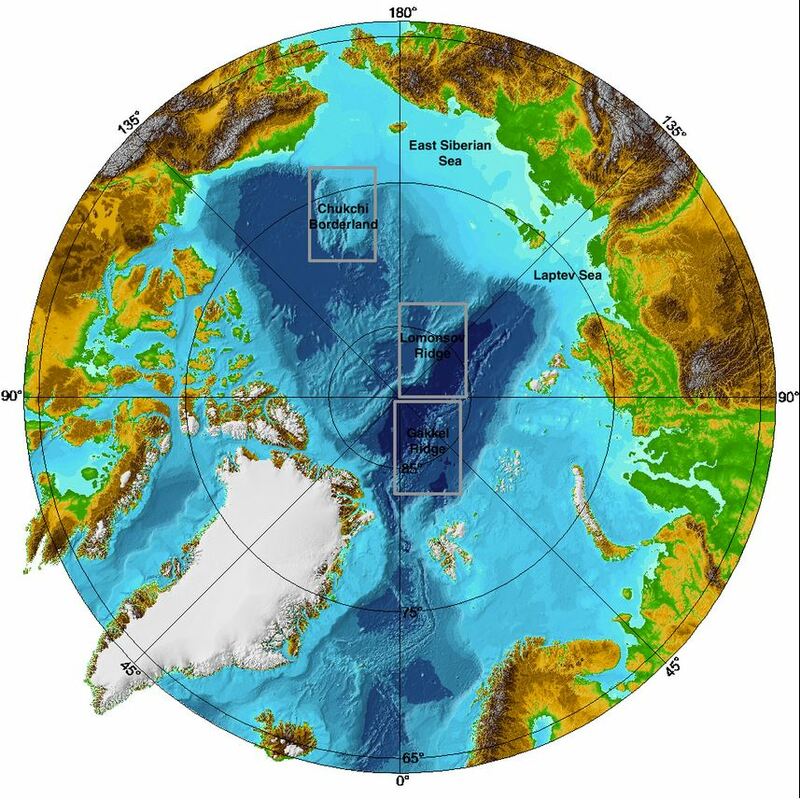 All three – Russia, Canada, and Greenland/Denmark have laid claim to a vast swath of the sea – and the North Pole – much of it on the basis of the very odd (and ambiguously understood) Lomonsov ridge formation. If Russia’s claims are rejected by the United Nations and no other country successfully claims the North Pole, it becomes a part of the Arctic called “The Area” which will be administered by the UN “on behalf of humanity as a whole.” But with Russia’s huge military presence in the north, a failed Russian scientific petition might not be enough to turn the North Pole over to international custody. This entry was posted in Exploration, Oceans and tagged Alaska, Arctic Ocean, Canada, continental shelf, Greenland, Lomonosov ridge, North Pole, oceanography, oil industry, Putin, Russia. Bookmark the permalink.